Sounds like they have a problem with their site. I would wait a while and try again, although,I did not create an account. I just download the app and started using it. Thanks, I just figured out I don't have to register to use it. Nice app! A grocery/list app that I use on my android (not available for iphone last time I checked) is Out of Milk. I love it for its ease of use. No learning curve. When you start it, there is a microphone in the middle of the screen. Tap the microphone and ask your question. App will answer your question, like Siri, only much faster. If there isn't a voice answer, you'll get a google search listing of pertinent sites. It works great for navigation... Simply say, "Navigate to the cheesecake factory in orlando, fl" and it will tell you the distance, traffic conditions, time to drive and turn by turn directions. There are many other google functions to this app, so if you have a Google account, there are many other items you can access...calendar, Google Voice, etc. You'll be amazed at how fast and comprehensive this app can be. I know I'm way late to respond to this question (new to the forums), but I thought the answer might be useful for some other folks. If you ever accidentally loose an app (i.e. let the grands play on your phone!) just go into the App Store and click Updates, toward the top is a button called Purchased, click it then switch the view from All to Not on this iPhone. You will be presented a list of just apps that you have previously installed but are no longer installed. Hope it helps some folks. I recently purchased Voice Dream Reader and am very pleased with it. It reads aloud to you in a pretty natural voice (actually, a dozen or more voices are available). As it reads it highlights the text, so you can follow along. It has easy controls to skip forward or back, adjust text size, and even change the rate at which it reads. It can load books directly from Project Gutenburg (45K books! ), read the text of a Web site or a PDF, or anything you can load into your clipboard. It can also read any text you add to another service, Pocket. Pocket is a simple way to mark web content that you want to read later, like news stories. So, for instance, you could scan through your favorite news sources, mark a bunch of articles to Pocket, and then in VDR load them and have it read them to you as you drive, exercise, whatever. Pretty nice. VDR is a bit expensive, I think it was about $10 and more for additional voices. But that's pretty cheap compared to a similar program I have on my computer which cost $40. The only downsides of VDR are: it cannot read most purchased iBooks (blame iTunes), and it cannot save the audio (to share, for instance). BTW, I looked at several other text to speech apps and found that all of the good quality ones required subscriptions, which would cost you more in the long run. I does have a free demo version if you'd like to try it out (reads for 10 mins a day, I think?). Enjoy! MY favorite app is ShopShop. I have it on my iPhone, iPad and my husbands iPad and Iphone. It syncs all 4 via Dropbox. Fantastic for shopping lists. I recommend Waze for maps, directions and traffic conditions. I also like In Touch Ministries. Both are free. Yesterday I downloaded "Place My Face" from Apps Gone Free. It is still free today. You paste someone's face on another body. It's a load of fun. Get it now while it is free! 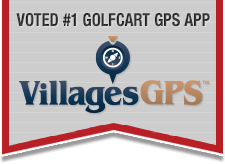 are there any clubs or courses in the Villages?